You are here: Home > Blog > Energy, sustainability & economics > Annual rings, drought and climate change. 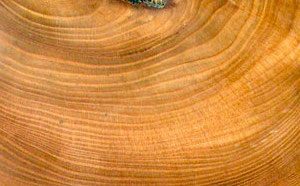 The change in growth rates was estimated by looking at growth rings - annual rings. Anderegg and colleagues looked at the recovery from various droughts since 1948 at some 1300 different sites - using the International Tree Ring Data Bank (a massive store of dendrochronological records). They found growth was reduced by some 9% or so in the year following drought, and remained 5% lower in the second year. The changes in growth mean that trees are absorbing less carbon dioxide during and after drought; this has implications for climate change. Generally, forests act as a carbon sinks that is they absorb carbon dioxide from the atmosphere and storing it away in the tissues of woody roots and stems. Drought affects the trees, so they will absorb and store less carbon dioxide thus making global warming even worse. Drought may not just reduce the growth of trees but may lead to changes in the species composition of forests over time. 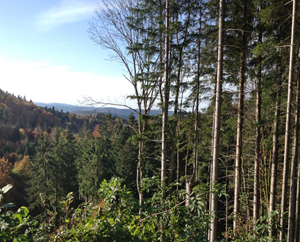 Researchers at the University of Freiburg (Vitali & Bauhus) have been looking at the effects of drought on the conifers trees of the Black Forest. These researchers also looked at the annual rings of some 800 trees at different sites in the Black Forest - concentrating on the effects of the droughts of 1976 and 2003. They found that the Silver Fir and Douglas fir were less affected by drought than the various Spruces in the Forest. 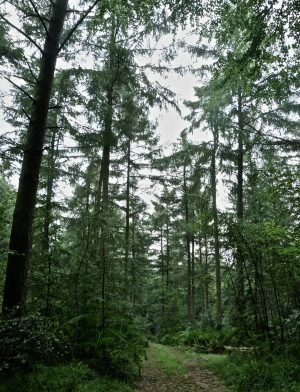 Spruce forests are therefore at risk of drought over a period of time, so replacing Spruce with a mixture of Silver and Douglas Fir is likely to lead to more productive and sustainable forestry.